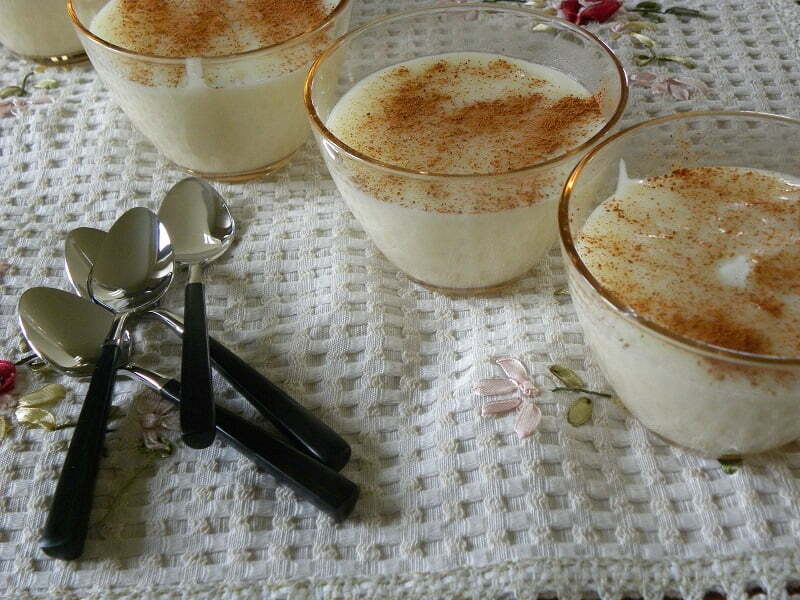 Τhis vegan Ryzogalo (Greek rice pudding) is creamy, aromatic and so delicious that it competes with the original classic “ryzogalo”, which is amazing! We all love the rich “ryzogalo” our mum used to make but there are many people who are lactose or gluten intolerant and of course there are many people who follow a vegan diet, or during Lent when we fast, so this one is suitable for all the above. I made this Ryzogalo when some friends visited us during Lent. My friend is sensitive to gluten, so I used rice flour to thicken it. You may think that corn flour (starch) is gluten free but, if you are aiming to avoid wheat, then check on the package that it is labelled “gluten-free” as many brands add wheat flour as well. I flavoured it with citrus blossom water and served it with ground cinnamon on top. Some other vegan desserts you can try during Lent. This coconut rice pudding is not only vegan but also lactose free and gluten free but equally creamy and delicious as the classic one! Daktyla, also called daktyla kyrion (meaning ladies fingers) is the most popular Cypriot dessert made with phyllo which is very crisp and very juicy, filled with almonds, cinnamon and sugar. They are fried and then drenched in syrup, scented with anthonero (orange blossom water), which make them irresistible. Shiamishi, are one of the best panigyria treats in Cyprus. These are made with homemade phyllo filled with an aromatic, vegan, sweet semolina cream, which is flavoured with anthonero (orange blossom water) and mastic and then deep fried. Coconut whipped cream is a dairy-free alternative to classic whipped cream, which is made with heavy whipping cream! Put the rice with water in a small pot and bring to a boil. Lower heat and simmer until all water is absorbed. Add the coconut milk, sugar and half can of water and bring to a boil again. Meantime, dissolve the rice flour in ¼ cup water and mix in the 2 tbsp blossom water. Add to the rice and mix until it thickens. Distribute the citrus water to wet 5 bowls by pouring it from one to the other. When the rice pudding has set distribute it into the bowls. Serve lukewarm or cold, with cinnamon on top. Delicious! This is a great dessert. this recipe looks mouthwateringly and reading it makes it sound really wonderful. I love anything with coconut and even more with coconut milk. And it especially suits my family being gluten free. Thank you for posting! Like I already mentioned on facebook, looks lovely on that beautiul lace tablemat. I love sweets made with coconut milk. Your coconut pudding sounds and looks delish, Ivy. Amazing post! It’s really a great information. Thanks for sharing the recipe.